Having lately borne witness to the exquisite efflorescence of Monteverdi‘s Ulisse and the odious implosion of the Red Sox bullpen, your storm-tossed reporter sought succor from such extremes of high drama at First Lutheran Church. 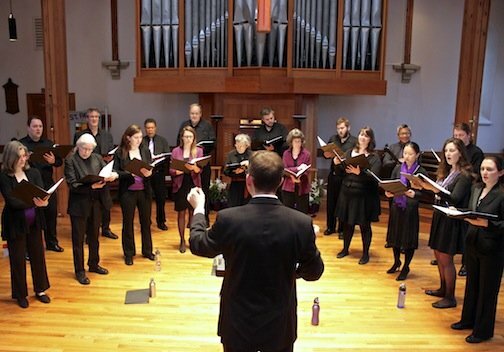 Here Boston’s familiar yet esteemed Convivium Musicum gently applied balm in their warm, balanced readings of sacred motets by Jan Pieterszoon Sweelinck. Lifelong organist at Oude Kerk, Amsterdam, Sweelinck (1562-1621) is prized today for ethereal if forthright keyboard works rather than sublimely set choral gems. Sweelinck’s pithy, deeply melodic choral works abound with aphoristic turns and concentrated musical imagination, whether secular madrigals and chansons for collegia musica and amateur groups, or sacred pieces for church choruses. Michael Barrett, music director and conductor, genially suggested that we might begin to appreciate the latter over the concert’s modest hour. Gaudete omnes, a five-part round both warm and seamless in dynamic flow, wound its elegant course with final alleluias. Three motets — drawing from a wedding parable (Ecce prandium), Jesus’ birth (Ab Oriente venerunt Magi) and bris (In illo tempore) and performed without a break — made equally joyous and celebratory statements. They too ended with Alleluias, each marked with a signature light gesture and energetic elan, and rang without echo, reflecting the austere elegance of Pietro Belluschi’s 1957 sanctuary of brick, glass and maple. For the first French Psalm, Barrett ceded the podium to assistant conductor Sarah Riskind. For the somber opening of Mon Dieu me paist (Psalm 23), the first of its three sestets is sung in plainsong, then repeated in full polyphony, sweeping gentle upwellings of dark but deep gratitude. Tanto Tempore, Jesus’ homespun homily to his disciples, and O quam beata lancea found Barrett leading his 22 choristers, reconfigured into antiphonal sections, happily in thrall to the benevolent, sovereign God of Calvinist monergy: “Oh, had I been in place of the lance”; Barrett signed them home with briskly surgical gestures. For Psalm 150, in Sweelinck’s setting of a familiar text (Or soit loué l’Éternel), Convivium arose in eight-part glory — assertive, joyous, onomatopoetic — to praise the Lord in this sanctuary with thrumming harp, tumtuming tambour, whirling fifes, (slightly) shrill cymbals: “Let every being that breathes and moves, forever sing to His kingdom!” Thus, a welcome “fringe” oasis during BEMF’s busy month.